Last weekend my talented friend Grace came over for a little cooking collaboration. 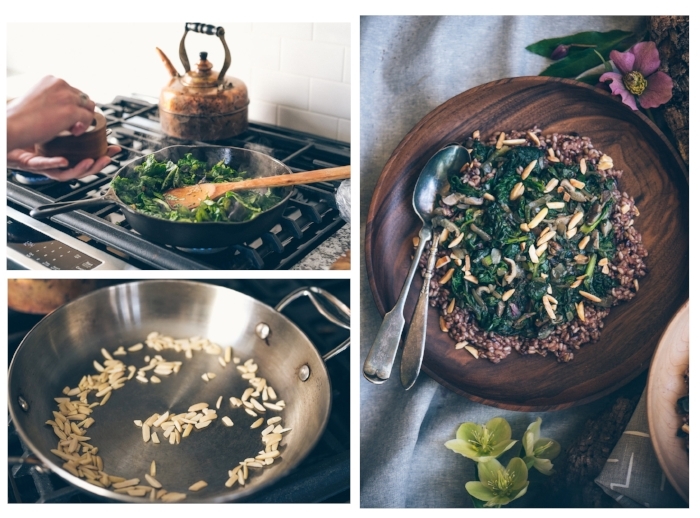 She is not only an extremely talented photographer, but also fills her food blog, Food, Fitness, Fresh Air with healthy and delicious recipes. We created an impromptu dish from some fresh ingredients that we just received through our CSA with the new River City Outpost in Manayunk as well as some delicious, locally grown rice from Blue Moon Acres Farm in New Jersey. This dish came together so simply and made a great afternoon lunch. It would also be perfect as a side dish to a larger meal. In a large skillet, heat olive oil over medium-high. Add onion and garlic, and saute until onions are nearly translucent. Stir in mushrooms, and cook another 3-5 minutes, until mushrooms get a nice sear. Stir in greens, and season with salt and pepper. Continue to cook, stirring regularly, until greens are tender, 3-4 minutes. Squeeze lemon on top, and adjust salt and pepper, if needed. 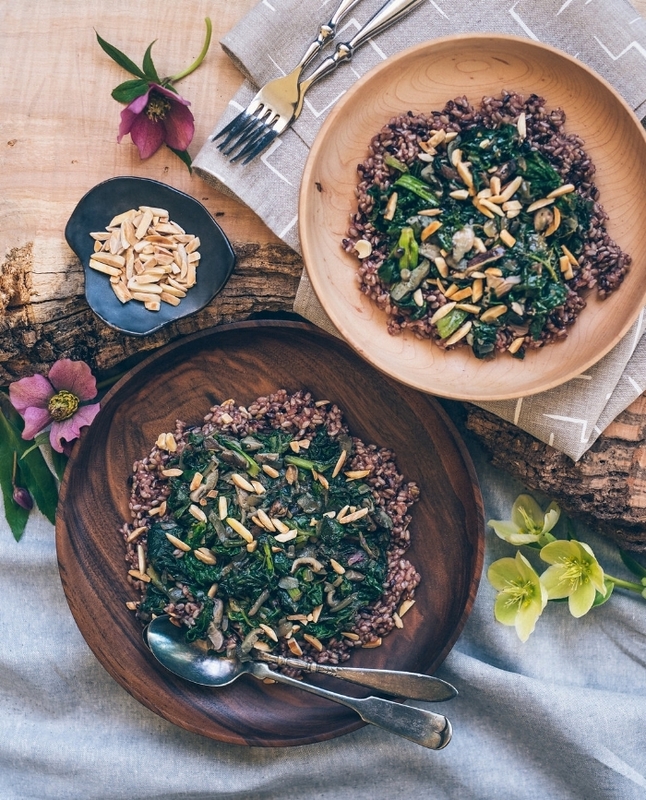 Divide rice between bowls (we used a bowl similiar to our walnut serving bowl), and top with greens. Scatter almonds across each bowl. Serve and enjoy! To see more of our serving and dining pieces, head to our online shop. A big thank you to Grace for her on point photography and recipe development skills. If you're looking for a great lifestyle and food photographer, she's your girl, you can find her portfolio here. And for more delicious recipes, check out her food blog, Food, Fitness, Fresh Air. Collaborating, encouraging, and lifting others up has been on our minds this year and so in that vein, we reached out to three artists and designers to team up and bring you our holiday gift packages that are a combination of each of our unique skill sets. Last year Sarah reached out to us about a collaboration. It was almost holiday at the time, and were were in the midst of moving to Philly, so we tucked the idea away as something we knew we wanted to do in the near future. The year went on and my obsession for ceramics grew :) When the holidays started to roll around, we knew we wanted Sarah to be part of our first set of collaborative collections. As a designer, I am continually fascinated with the mix and play of materials and thinking about combining the cool, organic feel of clay with the warm smoothness of wood felt like a perfect match. Sarah was born and raised in the southeast and apprenticed with studio potter Renata Wadsworth, where she learned the art of ceramics from throwing pots to building and firing a wood kiln. Through the years, Sarah has spent time in various studios developing her work and exploration of ceramics. Sarah recently moved to Kansas City where there is a thriving ceramics community and I’m feeling pretty excited for a meetup next time I’m in town. For our holiday gift set with Sarah we have paired one of her ceramic dipping bowls and one of our hand turned round serving boards in either walnut or figured cherry. The dipping bowl is hand thrown and features a matte white glaze with etched details in a contrasting black glaze, perfect for your favorite sauces, spreads, and snacks. The round boards make prepping snacks and serving a pleasure and they're perfect for layering with other arrangements and make a stunning display when not in use; crafted of one solid piece of wood that shimmers in the light, it can also be used as a cutting board as well. If you’re looking for the perfect Christmas gift created with consideration and intention and will offer lasting service to your gatherings for years to come, this is it. Head to our online shop to see more and happy, happy, holidays, we’re glad you’re here! Two moves ago we lived in Jacksonville, Florida and at the time, so did Claire. I didn’t know her personally, only through her work which I had seen in some local boutiques. I was just starting out in going more full time in my creative endeavors and I’m pretty sure I was in awe of her being a “real” artist. At some point, Claire moved back to be near her family in Austin, and we move another one, no, make that two times. I kept up with her work via social media and last year she reached out about a collaboration. It was almost holiday at the time, and we were in the midst of moving to Philly, so we tucked it in our back pockets as an idea for the near future. When we started thinking about working on these collaborative projects for this holiday season, I couldn’t help but think how beautiful Claire’s jewelry pieces would look with our wooden wares, she had recently released her Lanna collection which pays homage to Thailand, also known as the ‘Land of Smiles’. The pieces unique lines, colors and charms use materials that honor the spirit and love radiating from this beautiful country. This collection feels both of the moment and timeless with its warm silver and gold and black spinel and turquoise gemstones, a perfect pairing with our pieces. Claire grew up surrounded by a handmade culture with her parents both being ceramics artists. 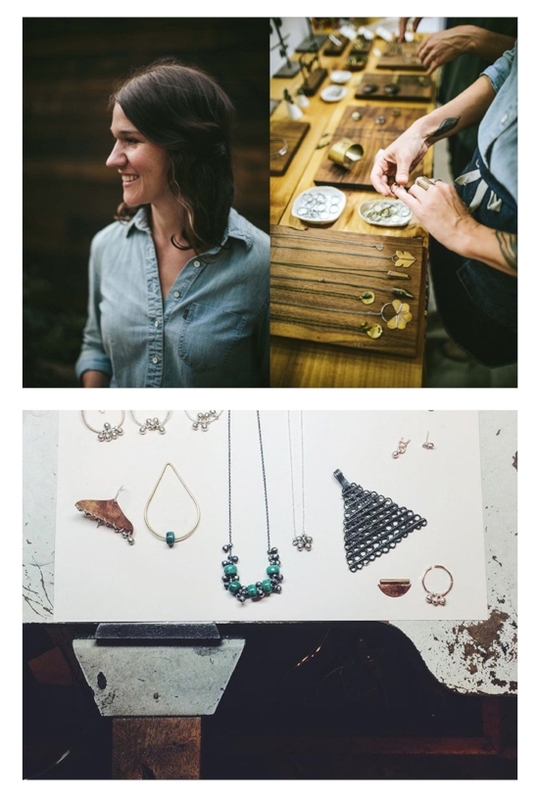 She attended Penland School of Crafts in 2009 where she fell in love with the many aspects of metalsmithing. Her work evokes ancient aesthetics and global culture with attention to detail. I love the timeless simplicity to all of her pieces where one can let the eye rest and contemplate the intention that went into the piece. The forms are versatile for both everyday wear and special occasions. For our holiday gift set we’re pairing a set of Claire’s Wasana stud earrings with a special edition skipping stone catchall dish. We’re offering them in turquoise and black spinel gemstone options with limed ash and black speckled hand turned catchall dishes; the perfect place to corral these precious pieces at the end of the day, as well as your rings or other jewelry. In Thai, Wasana means ‘lucky’ of ‘bringing good fortune’—a fitting name for an everyday stud and who wouldn’t be lucky to own a pair!? If you’re looking for that perfect Christmas gift that will be cherished and absolutely delight your loved one, this is it. Head to our online shop to see more. We'll be highlighting all of our collaborators this week in our journal, we hope you'll stop by to learn about their unique stories as well.